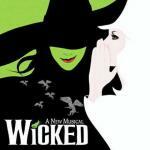 Defying Gravity by Kristin Chenoweth with length 5:53 by style is a musical that starts with the pronunciation of the words, shimmering in singing. And, of course, the whole composition is excellent transfer between word and melody. Sad, inspiring, one of the best in the collection of its energy, has the great beginning, the development and a spectacular finale. Overflows of voices are so sparkling, taking the listener into another world. Why couldn't you have stayed calm, for once! Instead of flying off the handle! Elphie, listen to me. Just say you're sorry! But I don't want it - No! Galinda, come with me. Think of what we could do together! There's ever been - Glinda!